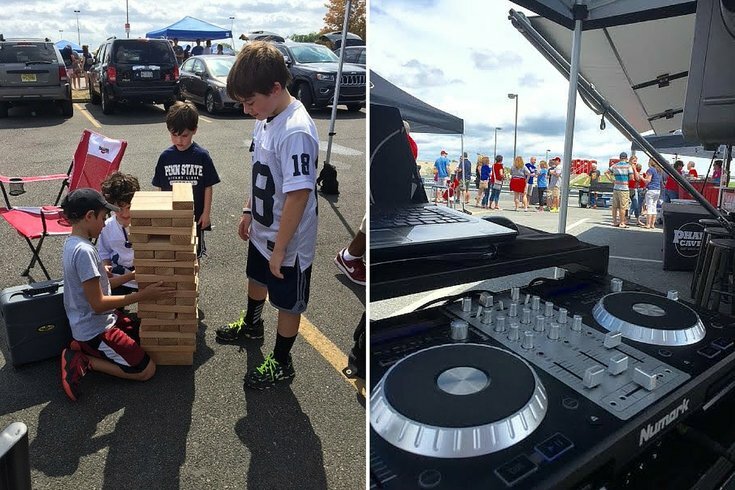 Kids play a large version of Jenga (left) and a DJ sets up at a Phan Cave event (right). Friends Colleen O’Hara and Jacqueline McDevitt know a thing or two about tailgating. The pair grew up as sports fans and both became college athletes, playing lacrosse for Penn State and Long Island University, respectively. From there, tailgating different sporting events with friends and family became a tradition so beloved that the pair decided to turn it into a career. Last football season, they joined the professional tailgating craze by founding Phan Cave, a business that provides charities, universities and corporate organizations with everything they might need for the perfect pre-game. Their main set up includes a 30-foot trailer with three TVs, bathrooms, music, coolers and grills, and they also recently added a smaller trailer to their "phleet." Since the co-founders launched their business last year they've packed their schedules with college and professional game days, private and corporate events and fundraising initiatives. In other words, when it comes to tailgates, they've seen it all. Below, O'Hara and McDevitt give their tips on hosting a tailgate, from do's to don'ts. Concerts, charity runs, block parties, birthdays, sporting events - if you love it, you can tailgate it. And if you are preparing a party for the big game, don't worry if you can't make it down to the Linc parking lot. Just head outside and get grilling. "A tailgate is a tailgate," O'Hara said. "Whether you win or lose, you still booze and have a great experience. People just like to be outside and enjoy the atmosphere." Just because you're outside, doesn't mean the world is your trashcan. If you're in a parking lot outside your favorite arena or concert hall, chances are there are plenty of trash receptacles nearby for beer cans and paper plates. If you're in someone else's home or backyard, don't expect them to do all the dirty work, either. Lend a helping hand and clean up after yourself. Take a few selfies if you want, but remember to really hang with the friends and family you've presumably gathered for the occasion. "In most of our environments today, our interactions are on a computer or on a cell phone," McDevitt noted. 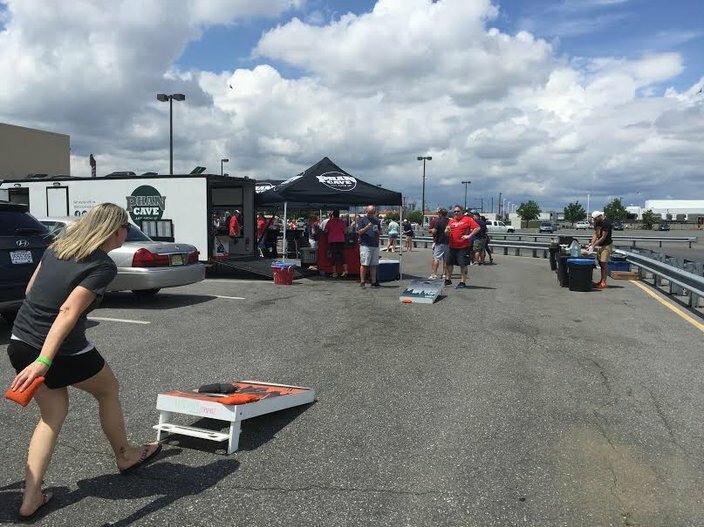 "When you’re tailgating you’re getting to interact with people. 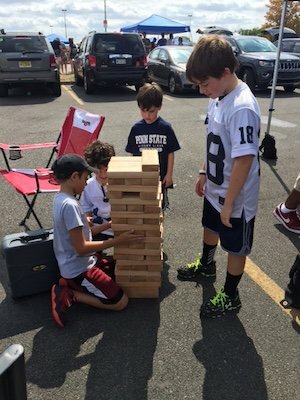 You’re all there for some cultural phenomenon ... so the tailgating aspect is a special experience." For O'Hara and McDevitt, the football tailgate sweet spot is a 4:30 p.m. game with a clear sky and a slight chilly breeze. But as the weather gets colder and nights get longer, you'll need to add a few supplies to your packing list. Hand warmers, hats and hot cocoa go a long way, but the Phan Cave girls have an extra trick up their sleeves from their college athlete days. "Put doctor’s gloves underneath your real gloves," McDevitt said, "You get sweaty, but your hands never get cold." No one wants to balance a drink in one hand and a big, messy burger in the other. When planning your food strategy aim for meals and snacks that can be eaten with one hand. Adding seasonal favorites never hurts, either. "Once it gets colder it’s awesome to make chili in a Fritos bag or hot sliders," McDevitt said. "Meatballs, sausage and peppers, too. But when it’s hot people just want hot dogs and chips and cold potato salad." 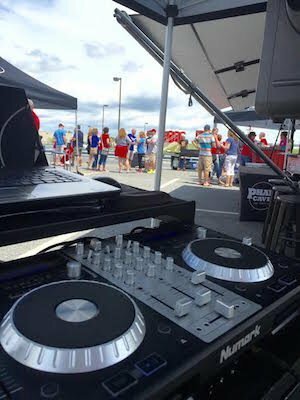 When you're looking to take the tailgate to the next level, consider hiring a DJ like Phan Cave does for each event. "Going from not having a DJ to having a DJ is like night and day," McDevitt said. "You could put your music on and you could make your playlist, but that DJ is feeling the crowd. He’s feeling that everyone ate and they’re kind of slowing down a bit, so let’s get ‘em pumped up. Or when everyone arrives, let's play the fight song." In a crowded pre-game parking lot, it's nearly inevitable that you'll end up bumper-to-bumper with another group. The camaraderie between tailgaters is half the fun, so don't forget to say hello and share in the excitement. Forgot a bottle opener? Ask next door. Do your new friends need napkins? Send a few over. "Even if they’re from other teams, you’re all there for the purpose to celebrate," McDevitt said. "You swap recipes... If someone has something really good and you’re like, 'Whoa what was that?' now you can add that to your repertoire." Make sure you know the difference between mingling and intruding. As a professional setup, Phan Cave often deals with wandering fans trying to use their restrooms or gate crashers stealing bites of food. They have even seen their bar used as a baby changing station! Of course, desperate times call for desperate measures and everyone is guilty of social slip-ups from time to time, but be sure to ask your neighbors before enjoying their food or using their supplies. "I wouldn’t go up to you at a restaurant and pick food off your plate and walk away, you know?" O'Hara said. Tickets are now on sale for the Phan Cave's event with Philabundance, the Turkey Day Tailgate Sunday, Nov. 22. The second annual event includes a Thanksgiving-themed menu and fall drinks while raising funds to fight hunger. Until Thursday, Oct. 22 tickets are just $35.